You know you've arrived at a great bed and breakfast when you look forward to seeing the owners as much as visiting the vacation destination. That's the ultimate compliment to John and Linda Smirk of the Cooperstown Bed and Breakfast, given that we regard Cooperstown as our favorite travel destination. John and Linda are two of the most down-to-earth B&B owners you will ever meet and welcome you like a favorite relative to their large 1902 Victorian home -- in the heart of the Village and walkable to many attractions. The Cooperstown Bed and Breakfast creates the perfect foundation for those traveling to Cooperstown to visit the National Baseball Hall of Fame, The Farmers' Museum, Fenimore Art Museum, Abner Doubleday Field, Fly Creek Cider Mill, scenic Otsego Lake, the picture-perfect tree-lined Main Street, and many other "Americana" attractions. The guest rooms, including two suites (one with bunk beds), are filled with old-world Victorian charm as well as amenities such as private bathrooms, air conditioning and ceiling fans. Some Cooperstown B&B highlights: An afternoon tea on the relaxing front porch with wicker or in the fire placed living room, and a cozy outdoor second floor porch with soft candlelight, ideal for lounging with a glass of wine. The unforgettable breakfast buffet includes homemade scones, cinnamon buns, waffles, sausage, bacon, cereal, yogurt, fresh fruit and juices. Afternoon and evening refreshments include fresh baked cookies and other baked goods, as well as fruit and cheese! Just writing this review makes us want to return to our favorite bed and breakfast and vacation destination, the magical Village of Cooperstown, N.Y. Candlelight Evening, Dec. 21, 2008, 3:00 pm - 7:00 p.m.
Cooperstown, N.Y., might be regarded by most vacationers as a summer travel destination, but events like the Farmers' Museum's Candlelight Evening prove that this magical Upstate New York Village is a special place, year-round. This year's Candlelight Evening will be held this year on Sun., Dec. 21, 2008, from 3-7 p.m. Representing the true essence of the holiday season, Candlelight Evening features a beautiful lit tall Christmas tree, musical performances by local musicians from the community and schools, much-needed warm wassail for a cold day, a special Santa Claus telling great children's' stories, horse-drawn carriage rides, comfort food in the tavern, and thousands of lights illuminating the scenic countryside. What a truly special time, one that we can hardly wait to attend every year -- even in the summer! The National Baseball Hall of Fame and Museum is a "must-see" for any Cooperstown, N.Y., visitor. You can find updates on Baseball Hall of Fame events and other happenings by visiting its News From the Hall of Fame section on its very fine Web Site. This is a great time to visit the Baseball Hall of Fame. It's more quiet in Cooperstown, so that means less of a hectic tourist crowd and a chance for you to visit, with more elbow room, one of America's great museums -- as well as one of America's greatest villages! Sometimes, it's hard to get a feel for a travel destination if photographs don't complement the content. As dedicated, passionate Cooperstown travelers, we have come up with a series of photos of Cooperstown and vicinity that we feel you will enjoy. Perhaps these visuals will inspire you to visit this truly special Village in the heart of Leatherstocking Country. You can access the slide show at http://www.cooperstownforkids.com/CooperstownSlideShow.mov. Depending on your computer's speed, it might take some time to load, but the Cooperstown photos are well worth the potential wait! Richard Duncan is a tremendous Cooperstown, NY, photographer with an inspirational story that can be read at the VisitingCooperstown Web Site. He has contributed immensely to area publications and books, such as Cooperstown, The Book. Richard's Web Site is also very nice with some of his photographs showcased. Richard is a true gentleman and incredibly talented. I encourage you to click on these links above to read more about this special person. Patti Drumm Grady, a local resident, has taken her considerable professional career management experience to create a "sweeter" career. She is the owner of the Cooperstown Cookie Company -- an "all-American" all-natural classic baseball shortbread cookie," available online and at Cooperstown area businesses. You can read all about the cookies and Patti's dedication to reaching out to others in her business at our "Cooperstown Sweets" section at CooperstownForKids.com. No matter how many restaurants we try every time we visit Cooperstown, we always return to the Doubleday Cafe. 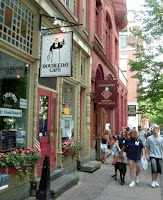 With its spirited bar/restaurant setting with high ceilings, brick walls, and picture-windows overlooking the lively colorful Main St., the Doubleday Cafe acts as sort of an unofficial community meeting place for locals as well as informed visitors who know the greatness of this Cooperstown dining landmark. Hitting a home run with virtually every breakfast, lunch and dinner item we've tried, we love the Doubleday for its food, its quick and friendly service, reasonable pricing and its pride of ownership. It's a terrific place for an omelette, salad, burger or fish or steak dinner special as well as some really great gooey, chocolate-based desserts Not only does the Doubleday Cafe capture the spirit of Cooperstown within its modest settings, but it does so with perhaps the most consistently good food in the Village. Our main site, CooperstownForKids.com, recently debuted The Adventures of Goldilocks O'Brien in Cooperstown. This series follows the fictional character Goldilocks O'Brien whose family moved to Cooperstown from New York City. With lots of humor and wonderful discoveries found in Cooperstown, we believe these stories will not only serve as great bedtime stories for your kids, but also as a travel guide, of sorts -- many Cooperstown travel attractions are mentioned in the stories!